Geoffrey Chapman Ingleton was born at Bairnsdale, Victoria on 14 May 1908 the eldest child of Henry Chapman Ingleton (Town Clerk) and Edith Harriott Ingleton (née Rout). His father later served as the Town Clerk of Bendigo and Mildura; and was also a sergeant in the Australian Army Pay Corps serving in England during 1918-19. Geoffrey had two younger sisters; Kathleen Edith born 1910 and Joan Chapman born 1914. In January 1922 Geoffrey entered the RAN College, at Jervis Bay, as a Cadet Midshipman where he quickly earned the nickname ‘Inggy’. He gained his colours for rugby and on passing out from the college in December 1925 he was awarded two months ‘time gained’ (out of a possible three months) for his academic results. Geoffrey was also awarded the prizes for mathematics and navigation and was also well known for his drawing prowess; it was reputed he spent his first pay on drawing instruments. In mid-January 1926 he joined his first ship, the light cruiser HMAS Adelaide in which he served until early April when he transferred briefly to her sister ship Brisbane. Geoffrey was back on board Adelaide in early May and was promoted to Midshipman on 15 May 1926. His report from this period indicated he was ‘keen to learn but slow to benefit from experience’ but also good at maths and navigation. After completing their initial training at sea, off the Australian east coast, the RAN College class of 1922 embarked in the SS Ormonde in late July 1926 and proceeded to England for further training with the Royal Navy. Soon after arriving in the United Kingdom, in mid-September, Geoffrey Ingleton joined the battle cruiser HMS Repulse. The battle cruiser was part of the Royal Navy’s Atlantic Fleet and, apart from a brief refit in July-September 1927, was active throughout that region. During his time under training in Repulse, Ingleton’s interest in nautical research was fostered by the ships training officer (or Snotties Nurse), Lieutenant Commander Charles Gray Pitcairn-Jones who was also a naval historian and later edited 'Piracy in the Levant, 1827-28: Selected from the papers of Admiral Sir Edward Codrington'. Geoffrey’s early officer reports noted that he was reserved and often shy in nature but was intelligent and an exceptional draughtsman; with the commanding officer of Repulse noting that his Midshipman’s Journal was the ‘best I have ever seen’. Ingleton later claimed that even Captain Edward Evans (later Admiral Lord Mountevans of Antarctic fame) who commanded Repulse fostered his interest in nautical research. Ingleton was promoted Acting Sub Lieutenant on 1 September 1928 and appointed to HMS Victory (Depot Ship) the next day to undertake an anti-gas warfare course before joining the Royal Naval College (Greenwich) for further training. On completion of his training at Greenwich, in March 1929, Geoffrey was confirmed as a Sub Lieutenant and he and his classmates undertook courses in navigation, gunnery, signals and torpedoes at HM Ships Victory, Excellent and Dryad. Geoffrey was awarded 1st Class Certificates for navigation and torpedoes and second class certificates for signals and gunnery. His later request to specialise as a navigator in the RAN was however rejected. On 26 October 1929 Geoffrey embarked in SS Orontes for return to Australia. Sub Lieutenant Ingleton arrived in Melbourne in early December 1929 and after six weeks of foreign service leave he joined the heavy cruiser HMAS Canberra on 14 January 1930 for training as a watch-keeping officer. He was subsequently awarded his bridge watch-keeping certificate in July 1930, promoted Lieutenant on 16 August 1930 and also qualified for the Board of Trade certificate as a ship's master in December 1930. During his service in Canberra the cruiser operated in Australian waters including the normal summer cruise to Tasmania for the Hobart Regatta in February. Geoffrey was described by his superiors during that period as ‘tactful and pleasant’ but with a ‘quiet and old fashioned disposition’. They further stated he was ‘not a strong personality’ and ‘not fond of social life’. On 13 October 1930 Lieutenant Ingleton was sent at short notice to the destroyer HMAS Anzac as a watch-keeping officer serving in her until 30 July 1931, when he was appointed to the destroyer HMAS Tattoo, again for watch-keeping duties. His time in destroyers was quite dull and was spent mainly on the east coast of Australia undertaking gunnery and torpedo exercises. Interestingly his Commanding Officer in Tattoo described him as a quiet and likeable officer with good leadership skills, very sociable and popular with the crew, keen and intent on his work and particularly good with his work as gunnery control officer, navigator and ships correspondence officer. Ingleton returned to the cruiser Canberra in April 1932 and was appointed as the ship's intelligence officer as well as conducting watch-keeping duties. During his time on board the cruiser circumnavigated Australia during the spring cruise of 1932 and also visited New Guinea and Dutch East Indies ports. In 1933 Canberra operated along Australia’s east coast and also visited New Zealand in August-September. While serving in Canberra, Geoffrey established Golden Lantern Press and undertook his first nautical history publication when he helped his friend, Lieutenant Alan McNicol (also from the 1922 entry to the Naval College and later promoted to Vice Admiral and appointed Chief of Naval Staff in 1965) illustrate his book of sea poems. Only 260 copies of the book, 'Sea Voices', were produced on board Canberra but it was the start of long and successful career for Geoffrey Ingleton as a nautical researcher, naval historian and illustrator. Geoffrey was assisted by Canberra’s Chief Petty Officer Printer Henry Boyd and the following year a second book of poems titled 'Sea Noises', by Engineer Lieutenant John William Newell Bull, was produced with Geoffrey producing the illustrations for this as well. 240 copies were produced and both it and 'Sea Voices' received favourable review in The Bulletin. Also while based in Sydney, Geoffrey undertook training in etchings from the well-known art teacher John Barclay Godson. Professionally, however, his ability as a naval officer on board Canberra was mixed. In one report he was described as an effective divisional officer yet a few months later his leadership was called into question as were his officer like qualities. In October 1933, Lieutenant Ingleton was sent to Singapore, in the SS Mayelle, to join the destroyer HMAS Vampire which had been recently commissioned in the RAN; after prior service in the Royal Navy. He joined the ship, as a watch-keeping officer, on 28 November 1933 and she arrived in Sydney in late December 1933 after which the destroyer was placed in reserve on 31 January 1934. Geoffrey Ingleton was then appointed to the RAN’s Training Depot HMAS Cerberus, at Western Port, on 13 January 1934 taking up general duties within the base. His service at Cerberus was far from effective and the Commanding Officer (Captain Harold Franklin, RN) had Ingleton placed on ‘special reports’ due to poor performance particularly in leadership, power of command, laziness and his lack of tact in dealing with subordinates. Furthermore Franklin stated that Geoffrey showed more interest in art and naval history then he did in his naval duties. While at Cerberus Geoffrey wrote and illustrated his first book, 'Watchdogs Infernal and Imperial - Warships Cerberus: Records of Service' (31 pages long and a limited edition). While his naval career was waning he was gaining significant experience as a naval historian, marine illustrator, ship model builder and collector of rare books, manuscripts, documents, ships logs, maps, drawings and paintings concerning early Australia - particularly maritime exploration. Noting that he had performed effective service in destroyers and was a gifted illustrator and skilled at navigation, Geoffrey was appointed to the newly commissioned survey vessel HMAS Moresby as an Assistant Surveyor 4th class. As much of his prior service was in cruisers and battle cruisers perhaps the navy thought he was more suited to small ships. Lieutenant Geoffrey Ingleton undertaking survey work in northern Australian waters while serving in HMAS Moresby (Ingleton family collection). Lieutenant Ingleton joined Moresby on 11 April 1935 and took part in surveys off Wilson’s Promontory in May, before steaming north to Darwin to commence surveys in northern Australian waters in July. Just prior to sailing Geoffrey married 22 year old Josephine Hilda Weekes, on 23 April 1935, at the Congregational Church in Pitt Street, Sydney, NSW (now the Pitt Street Uniting Church). They later had two children; a son Nicholas (who became a Merchant Mariner and in later life a book publisher) and a daughter Michal (who became an author under the name of Michela ‘Kelly’ King). They remember him as a highly intelligent man who was extremely focussed on his work, not overly fatherly but still quite proud of his children’s achievements. Geoffrey Ingleton’s service in Moresby proved less than satisfactory. His Commanding Officer’s report of July 1935, after only three months on board, stated that while Ingleton had the ability to do well he chose not to. Furthermore it was reported that he resented the long hours of duty, which was normal in a survey vessel, was obstinate - bordering on insolence, and his control of the men under his command was below average. The bottom line was that he was not suitable for service in survey vessels. On 26 August 1935 Geoffrey was posted back to Cerberus with his career very much uncertain. Only a few weeks before, however, tragedy struck the Ingleton family when, on 12 August 1935, Geoffrey’s youngest sister Joan was killed in a car accident near Mordialloc, Victoria. His father had already died suddenly in 1933. Geoffrey was posted additional to Cerberus, on 26 August 1935, and a few weeks later noting his family situation and his continued poor performance as an officer he was placed on half pay for six months. He was allowed to retire from the Navy on 9 March 1936 and was subsequently promoted to Lieutenant Commander on the Retired List on 16 August 1938. It would appear that Geoffrey Ingleton was a ‘square peg in a round hole’, and while not dismissed from the Navy he was allowed to quietly and politely leave the service. Ingleton then started civilian employment as a draughtsman and artist. In 1937 he produced a small booklet titled 'Fine Etchings Of Ships That Helped To Make Australian History' with appreciations written by Rear Admiral Lane-Poole, Commanding the Australian Squadron, and also the renowned Australian artist and ship model builder Norman Lindsay. One of his first commissions was to design the dust jacket for Mary Ernestine Hill’s fictional novel based on the life of Matthew Flinders. Literary folklore states that Angus and Robertson, who published the book in 1941, were unwilling to accept the author's suggested title and that Ingleton suggested an alternative of 'My Love Must Wait' (in reference to Flinders several years as a prisoner of the French on Mauritius while his wife was in England). This title was approved by the publishers but Hill strongly opposed it. She later reputedly thanked Ingleton as the title improved book sales, especially to US Navy sailors who sent copies home to their wives. On 10 December 1940 Ingleton commenced employment as a temporary draughtsman in the Navy Hydrographic Office at Garden Island (moving some years later to the IMB Building in Kent Street). As a result of an increasing workload following the entry of Japan into the war, he was made a permanent staff member and worked in the Hydrographic Office continuously until he retired in 1973. 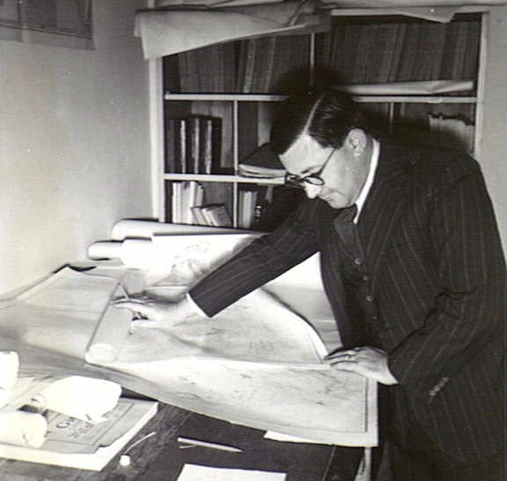 Initially he was employed to compile charts of Port Moresby and later charts of the Great North East Channel (Torres Strait). On completion of these tasks he was employed planning, checking and arranging for the printing of Australian charts. 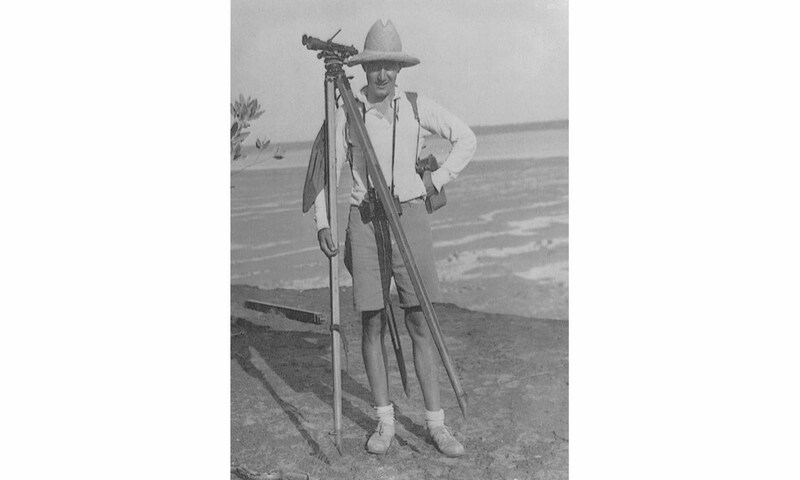 Subsequently, due to his eye for detail, he drafted the official correspondence for the RAN Hydrographer including various hydrographic instructions, charting agreements, monthly implementation reports and the five yearly hydrographic survey plan (Hydroscheme). 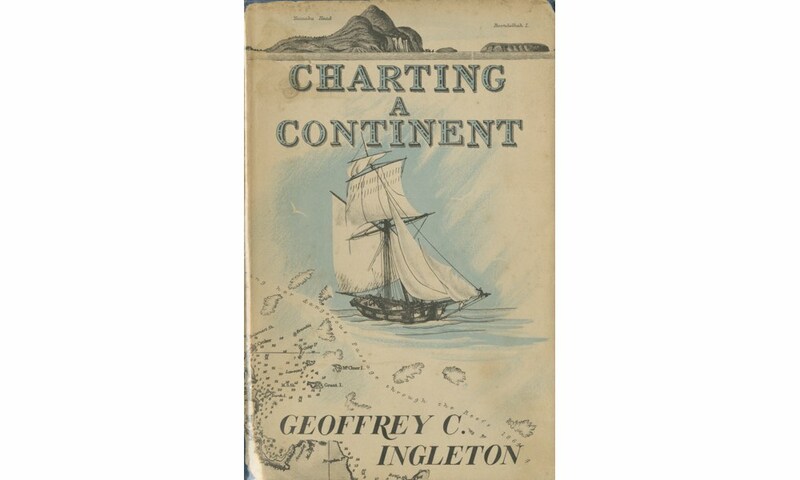 Charting a Continent by Geoffrey Ingleton (1944). This was his first major work and described the hydrographic work of the Royal Navy and the Royal Australian Navy from 1770 - 1944. In 1944 he produced his first major work 'Charting a Continent', published by Angus and Robertson. This book covered the period from James Cook’s exploration in 1770 through to the work of the RAN Surveying Service during World War II. The book received mixed reviews, being described by one reviewer as a ‘valuable contribution to geography and naval history’, while The Bulletin was less effusive stating it was ‘pretty tough going’ and ‘hardly more than a list of marine surveyors, historically important but oddly dry for such a wet theme’. In 1946 Ingleton designed the Australian Hydrographic Service emblem for use on RAN charts and this is still in use to this day. During the war the Ingletons moved to The Grange at 20 The Park, Parramatta which became the family home. Hearsay is that Geoffrey bought the house as there was a possibility the Hydrographic Office was to move from Garden Island to Baulkham Hills to free up office space at Garden Island. In 1969 he became the officer responsible for the production of the routine 'Notices to Mariners' and continued this task until he retired. His final artistic endeavour was to prepare the cartouche for the chart published to commemorate the Captain Cook Bicentennial in 1970. Geoffrey Ingleton also continued to collect maritime items and work as an illustrator, producing etchings and portrayals of early Sydney life based upon his extensive maritime knowledge and research. Apart from his work in the Hydrographic Office he also illustrated a number of other books including the contentious 1945 edition of Georgian House’s book 'Love me sailor' by Robert Close (Robert Shaw). The book was a romance novel between a sailor and his girl onshore, but both publisher and author were charged with obscene libel in the Supreme Court of Victoria and found guilty. Close was sentenced to three months in prison but served only 10 days and was fined £150. The book was banned in Australia, but this only made it more popular and it was reprinted overseas several times throughout the next thirty years. Less controversial were the books 'Heemskerck Shoals' by Robert FitzGerald (published 1949), 'History of the Royal Australian Naval College' by FB Eldridge (published 1949), 'True Patriots All - News from Early Australia', a collection of broadsides compiled by Geoffrey Ingleton (published 1952), 'The Romance of the Great Barrier Reef' by Frank Reid (published 1954), 'The life and times of James Milson' by Roy Goddard (published 1955), 'The Explorations of Captain James Cook in the Pacific' edited by Archibald Grenfell Price (published 1958), and 'Peter the Whaler in Southern Seas' by Max Colwell (published in 1964). These books were well illustrated by Geoffrey, whose drawings were known for always being technically correct (he painstakingly created the etchings on copper sheets and printed them on a press at the family home in Parramatta). He was also a keen model ship builder - generally sailing ships - which were also known to be exceptionally accurate reproductions of the original vessel. In late 1953 Geoffrey and Josephine were divorced following a court case in which her alleged adultery was proven; Josephine later died in January 1958. Geoffrey then married 35 year old poet Nancy (Nan) Furness at the Registrar General’s Office, Sydney, NSW on 19 December 1953. During 1971-77 Ingleton sold the bulk of his book and chart collection, totalling over 14,300 individual items, which he recorded in five catalogues that were compiled and later issued as a single volume titled 'A Catalogue of Select Books from the Ingleton Collection' - this became a nautical reference book in its own right. Ingleton kept the hydrographic portion of his library, relating to Australian waters, and this allowed him to complete his magnum opus. This involved many years of painstaking research and illustrations to produce 'Matthew Flinders: Navigator and Chart Maker' which was published in 1986 by Genesis Publications in England. It has since become the definitive history of Matthew Flinders. Regrettably his health began to fail and he was unable to attend the book launch in 1987. There are however some errors in the book which were a result of Ingleton being so certain of his facts concerning Flinders that he would not allow others to proof read his manuscript. During the 1990s Ingleton sold the remainder of his collection with many items being purchased by the National Gallery of Australia, National Library of Australia and other similar institutions. Two of his ship models, those of First Fleet vessels HM Ships Sirius and Supply, were purchased and displayed in the Powerhouse Museum. He was a member of the Society for Nautical Research, the Hakluyt Society, the Australian Institute of Navigation, the Royal Institute of Navigation and several other associations. He had an extensive collection of their publications and was also a significant contributor of articles to them as well. Despite his many abilities he was a difficult individual and did not always get on easily with his professional associates at both the Hydrographic Office and as a historian. It is reputed that on one occasion, in order to prove a historical claim, he had a RAN survey vessel redirected to enable the ships staff to visit a remote island and climb to the highest point to ascertain that, if on a clear day, the north coast of Australia could be seen. Allegedly when typing out the ship's orders he had left enough of a gap to insert the directive to do so, but after the RAN Hydrographer had signed the document. When the ship returned to port the subterfuge was discovered. On another occasion he entered into a dispute with another nautical historian, Alan Villiers, concerning which passage Luis Vaz de Torres took through what became the Torres Strait in 1606. Based on tidal data, Ingleton claimed Torres had used a different route than that claimed by Villiers, due to water depth in that area at that time of year. He was also involved in a long running discussion with other navigation experts regarding Cook’s calculations regarding the actual location of Point Hicks when sighted in 1770. Geoffrey Chapman Ingleton, one of Australia’s foremost maritime historians, died in Sydney on 28 February 1998 aged 89 and was buried at Pinegrove Memorial Park, Minchinbury, NSW; his headstone including the Hydrographic Service emblem. He was survived by his wife Nan (1918-2008) and two children, seven grandchildren and several great grandchildren. 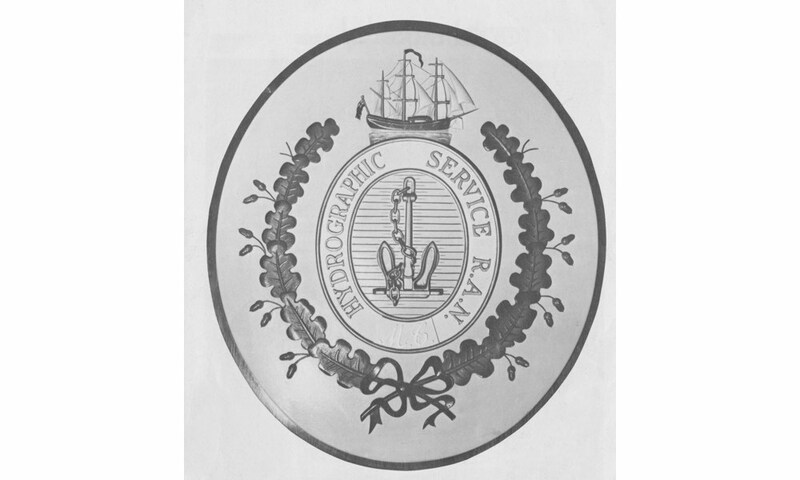 The Royal Australian Navy Hydrographic Service badge designed by Geoffrey Ingleton.